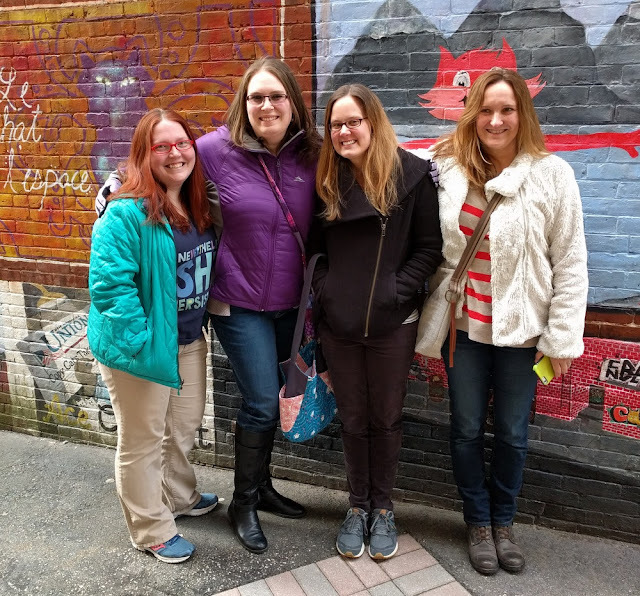 Last weekend, my husband and I drove 5.5 hours up to New Hampshire to attend MQX (Machine Quilters Expo) for the first time! My friends have told me that if I want to see awesome quilting, the place to go is MQX. I submitted two quilts to the show and they both got juried in (above is Fall Spectrum, in the modern category), so there was even more of a reason to go this year. Plus, I have several friends in the area, so we met up and ate a fantastic Italian dinner, significant others included! MQX is a large quilt show, spaced out over 2 rooms, and a huge portion of space is dedicated to special exhibits (more on that below). First, let's talk about the modern category, titled "Machine Quilting the Modern Way." Modern quilting was one of the larger categories, boasting 27 quilts (super exciting!). I'm always very interested in how the modern quilting movement is portrayed in different quilt shows. The movement itself is still fairly new, especially to shows themselves; according to my friends, it was nice to see modern quilts interspersed amongst all the quilt categories this year. I had to agree even though I had not attended in the past. Modern quilting officially broke out into almost all the categories! 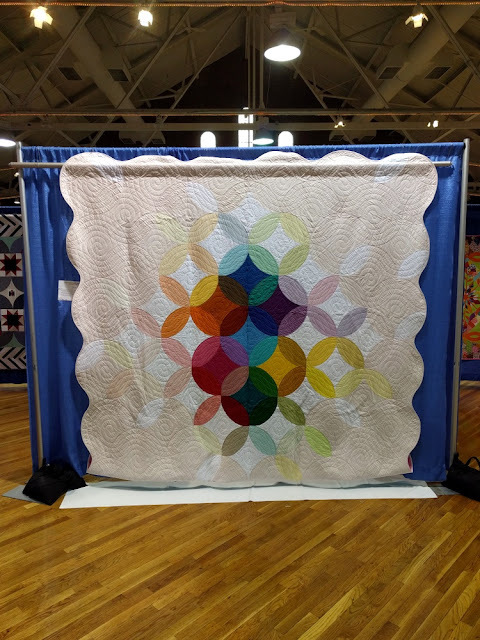 I've attended two QuiltCon shows (the major annual show by the Modern Quilt Guild), and I noticed a lot of differences between QuiltCon and MQX. Whenever I lecture about modern quilting, I try to emphasize that no one has a monopoly over the actual definition of "modern quilting". It's quite hard to define, but based on what I saw at MQX, most of the quilts would fit more into what I'd consider "modern traditionalism" rather than "modern" according to the Modern Quilt Guild. This makes sense because MQX has been an art quilt/traditional show. 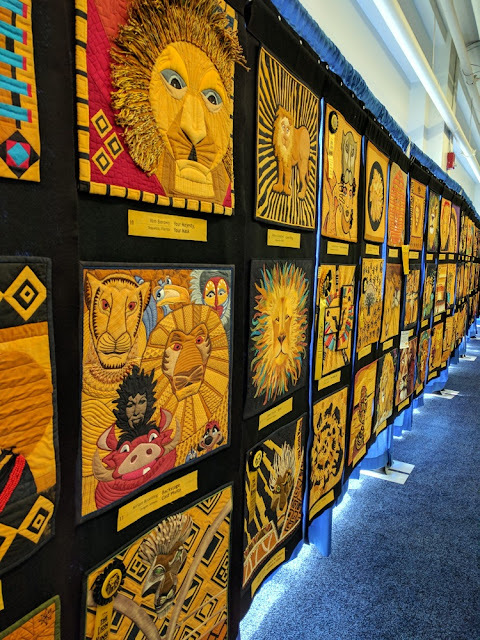 Now, it might sound silly to compare a show of 27 quilts to QuiltCon's 400, but since modern quilts are still very much a minority at MQX overall, I thought it would be useful to take some notes. The quilting was the star, and it was very detailed and dense (which I loved!!). 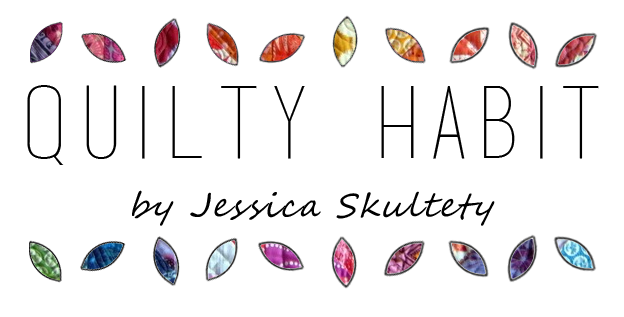 My ultimate goal is to inspire more modern quilters to experiment with creative quilting. Many quilters at MQX used different colored, variegated, and metallic threads. There were even some embellishments. 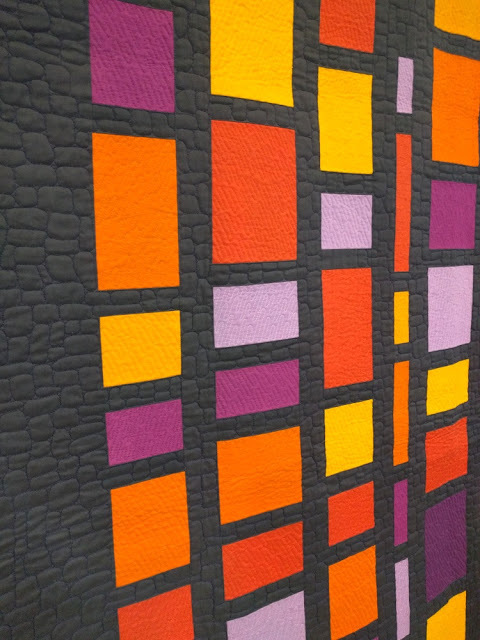 You'd be hard-pressed to find much of that at QuiltCon, where quilts seem to be curated towards minimalism. Not that that's a bad thing - it's just different! Lots of printed fabrics. 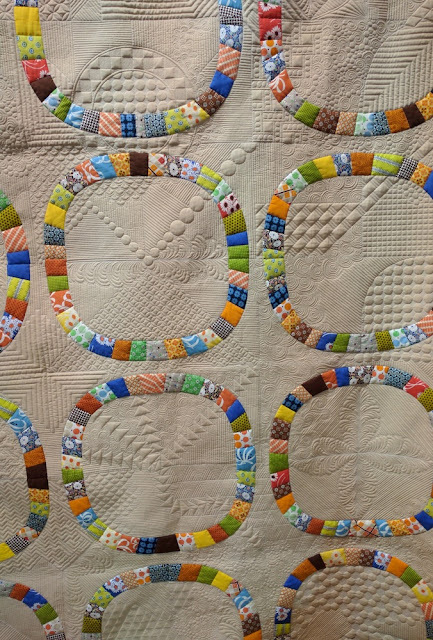 Anyone who attends QuiltCon knows that there's an emphasis on solids. Not at MQX. Very little improvisation. My quilt may have been the only improv quilt in the category (I could be wrong but this is what I remember days later). A couple quilts were decidedly minimalist. There were several sampler quilts, including the gorgeous first place winner, and I saw some experimentation with alternate gridwork. Lots of variety. 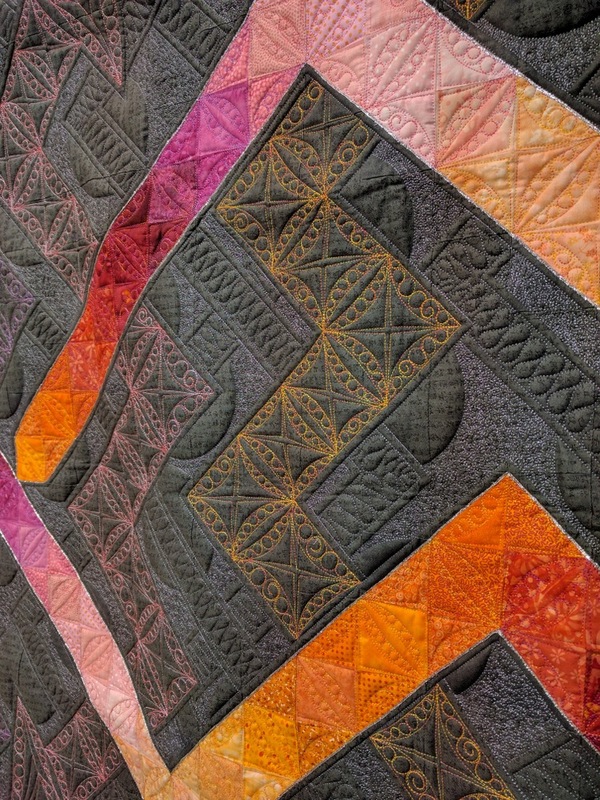 If you've made a quilt focused on machine quilting, you can probably find a category to enter. Mike noted that many of the quilts fit into other categories. I LOVED that so many of the quilts' backs were on display! This is the only show I've been to where quilting really was the star. In a similar vein, there seemed to be less of an emphasis on creating original designs (unlike QuiltCon). Quilt backs!! A show all on their own. Victoria Findlay Wolfe had a huge, gorgeous special exhibit of double wedding ring-inspired quilts. This was my favorite part of the show. When you walked into the smaller show room, this quilt was the first thing that greeted you, down a long row of vendors. There were several instances of the same pattern being made twice but quilted differently. Sometimes these were in separate parts of the show (but I'd recognize them and marvel at the differences). Sometimes, they were in the same exhibit (there were 2 Tula Pink butterflies in the modern category, and another in the next aisle over - it was a little confusing!). "Today I Feel" was there, too! It looks totally different in every picture. I'd heard about the Cherrywood Fabrics Lion King exhibit for a while, but never had the pleasure of seeing it. 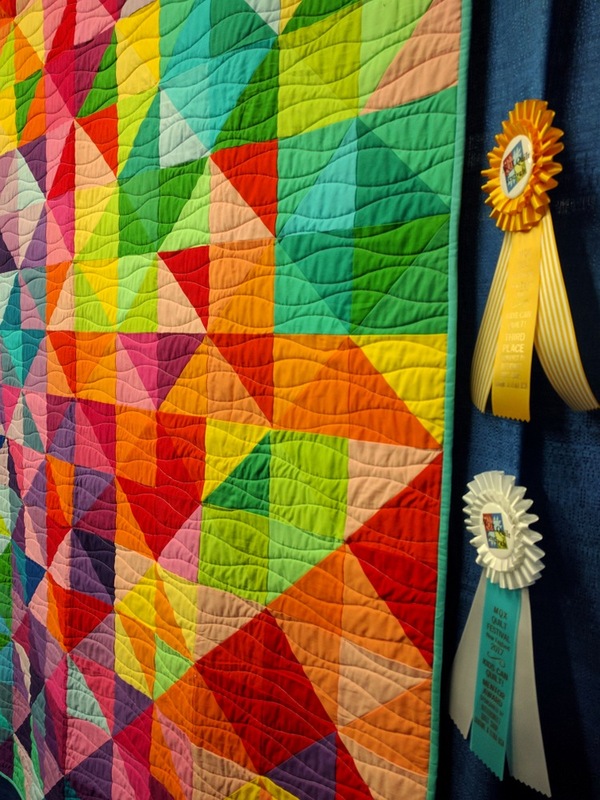 Luckily, over 100 mini quilts were on display at MQX this year! It was absolutely fascinating and fun to see which quilts Disney had chosen as their favorites (as evinced by a special ribbon). Eye candy for miles. 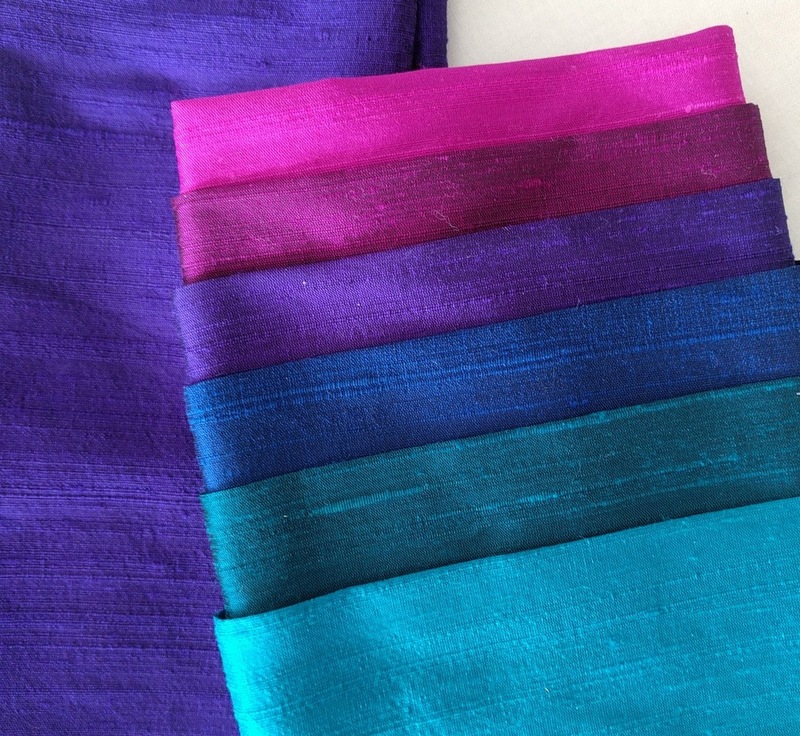 Fat eighths and a fat quarter of Dupioni silk from Country Keepsakes... gah! So beautiful and exactly my current favorite colors. 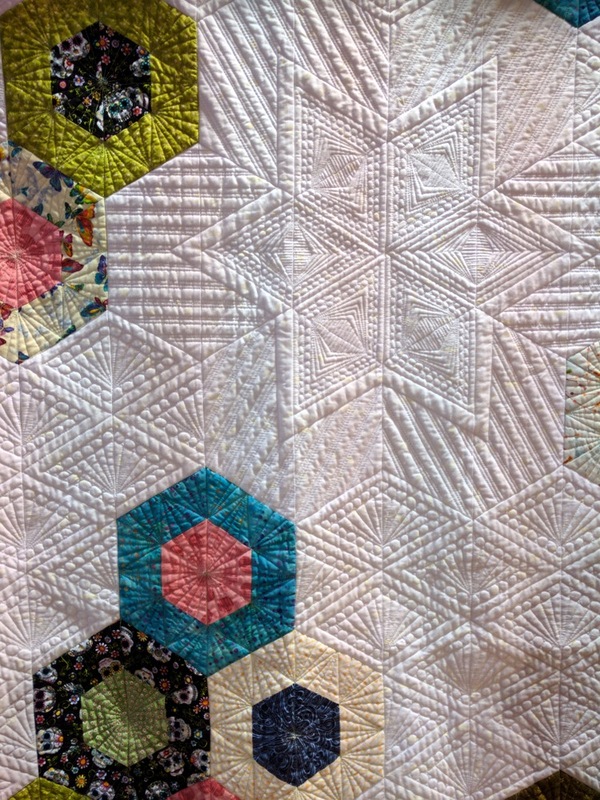 All in all, MQX was a unique experience that you can't miss if you love quilting. The next show is MQX Midwest - in Springfield, Illinois, this September 27-30. I'll be curious to see from afar what the modern category looks like, if I can find pictures! Did you attend MQX, or have you in the past? What are your thoughts about modern quilts in other quilt shows outside of QuiltCon? Insightful and informative discussion of the differences between the 2 shows. A knowledgeable friend told me recently that the MQG was becoming too rigid in what it defines as modern. Thank you, Jackie! Modern quilting is one of my favorite discussion topics. 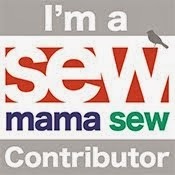 That being said, I think there's a place for everyone in the modern quilting world. I love and respect the MQG, and their show is curated a specific way, just like other quilt shows. That's why I encourage others to submit to other shows, like MQX for example. 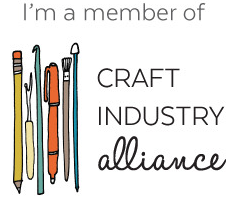 I worry that people get discouraged not to share their work if it doesn't fit into QuiltCon. The only way modern quilting will continue to grow is if we grow it ourselves, right? It was such fun to meet up with you at MQX and attend the show for the first time! The only other quilt show I've been to is QuiltCon, so I have a limited frame of reference ... I, too, enjoyed seeing the backs of quilts, and the VFW exhibit was a highlight for me. The experience solidified something for me: I am a modern girl. Although I could appreciate those quilts with style outside of that, they're not my thing. Very interesting that there was so little original designs in the modern category. 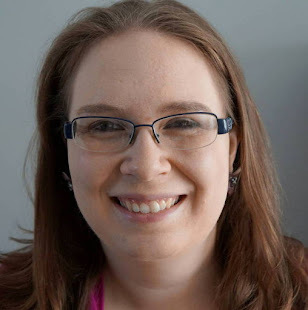 While there are modern quilters who publish patterns, QuiltCon does seem very focused on original work (not exclusively, but it is much more rare). I really appreciate your insights and thoughts. It has been quite a while since I attended anything other than QuiltCon. And huge thumbs up to showing off the backs of quilts! Awesome! What a really interesting post to read Jess. I love hearing about all the different US shows - they all sound soooo different from the UK ones! Thanks again for a very informative show review, love the photos and you thoughtful comments. Your quilts look great in this company! I love how the back of the quilts were also shown...maybe that can start a trend. This was an interesting read I really loved Quilt Con have never been to MQX and. To me there were a lot of quilts at QC that to me weren't minimalist, but I get what you are saying. Many of the quilts at QC labelled modern traditionalism were really pushing the boundaries of traditional whereas those pictured here fit more neatly into what I would call Modern Traditionalism.....it's all so interesting...and I continue to be inspired. This was neat to read! I hope you get a chance to go to a AQS show that has a modern category and can compare it to MQX and QuiltCon too. I entered our charity quilt in the Grand Rapids modern category, so it will be interesting to see if it gets in and how it does. 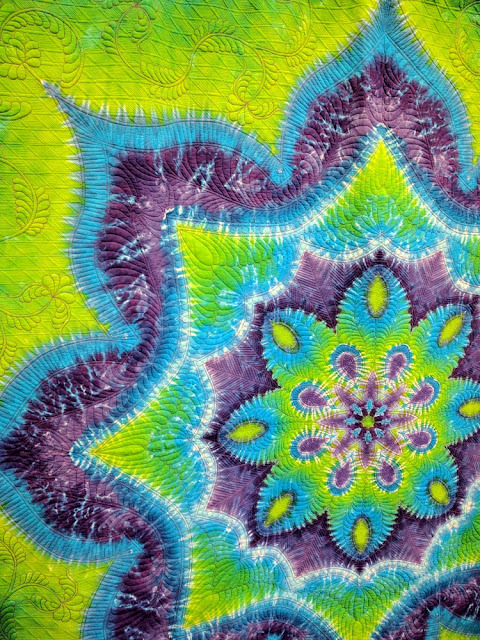 The Fiber Arts Fiesta in ABQ has a modern category that I entered a quilt in this year, it will be interesting to see what the rest of the category looks like. thank you for the pictures! Your work is very inspiring! 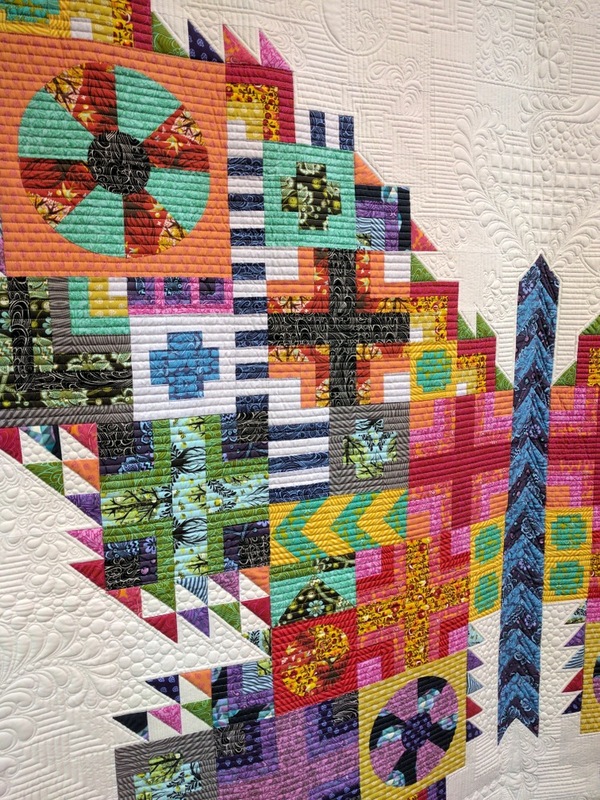 I do all of my quilt show visiting vicariously through posts like this one, so thanks for sharing! I love the MQX shows the back of the quilts. 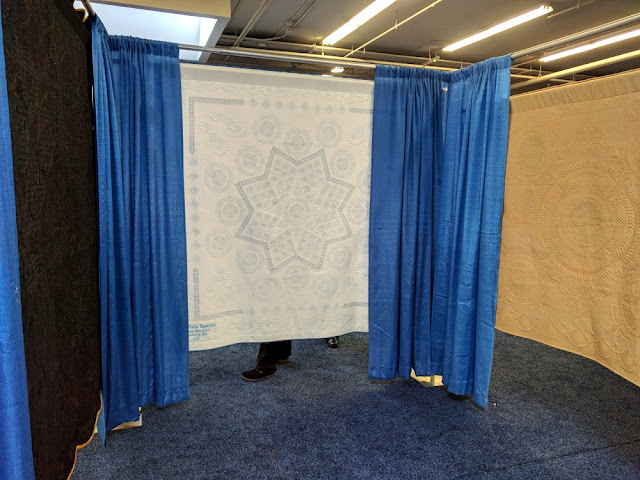 I always want to see the back of a quilt, and to show the backs of my quilts to people too :) It's fun to see pictures of you with your quilts hanging in the show. 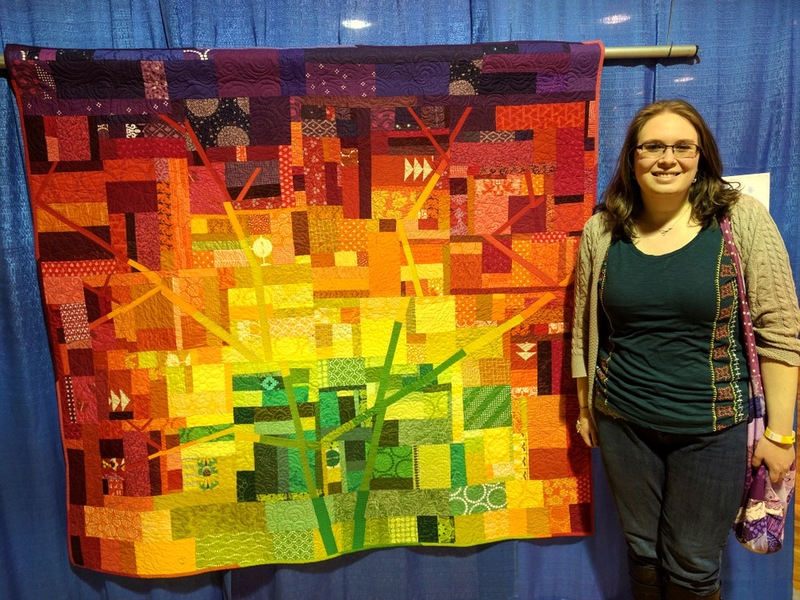 I too was at MQX (it's practically in my backyard) and I adored your quilt "Fall Spectrum". It's really nice to see how the Modern category at MQX has grown over the years! Loved your comparison of the two shows. 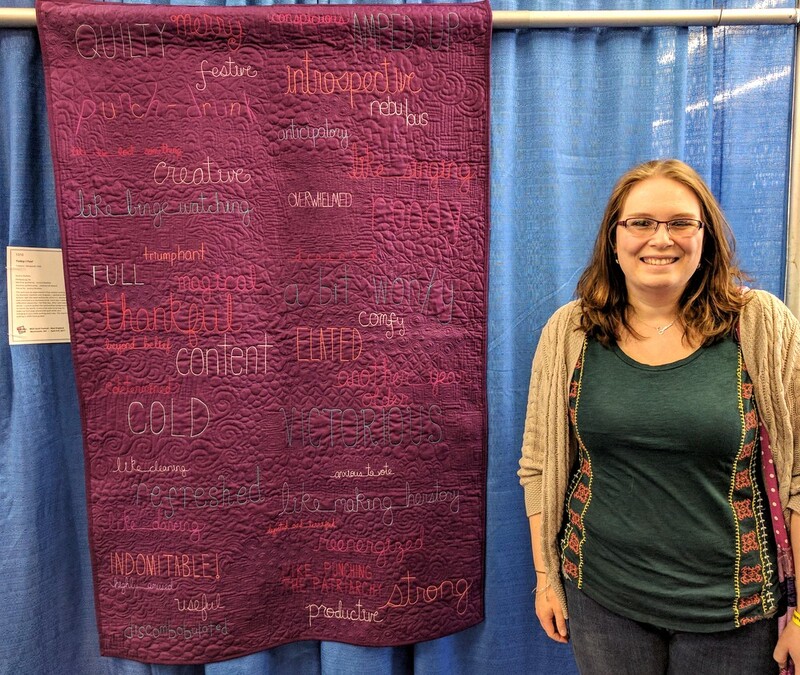 This year was my first time at QuiltCon and I feel the same as you in a lot of aspects. Thanks for sharing! I spent one day at MQX and wished I could get back for another, since I live in the area. I even had a quilt hanging, a first for me in a large show. I am glad you enjoyed it. I agree that the Lion King exhibit was just wonderful! Congratulations on having your fabulous quilt in the show. Thanks for the photos and article. I hope someday I can actually go to MQX instead of just getting to see the photos online. It is interesting to see how different groups define modern. Two years ago, I entered a quilt in MQX Modern Category where I was thrilled to win a ribbon. 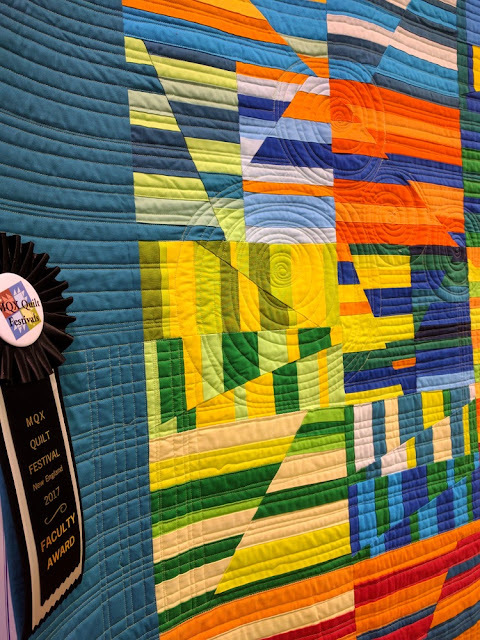 I entered the same quilt in a regional show's new Modern Category and it was moved to another category. The show organizers told me it was because it included feathers and feathers are NOT modern. I've been lucky enough to go to QuiltCon twice now where I've seen a whole lot of feathers...? I plan to just keep quilting what I like and I don't care how anyone else defines it. Thank you for such an interesting article. I live in the UK so am not likely to ever get to either Quiltcon or an MQX show. (Quiltcon was always on my wishlist, but I think it's just been replaced.) I am always interested in how the modern quilt movement is defined. I think of myself as a "modern" quilter, even though I don't do improv and often use what are thought of as traditional blocks. The most interesting thing to me is how each individual has chosen to quilt their creations. I think the comments I've just been reading are fascinating too. Thanks again, and thanks to everyone who has commented. Oh, I love the colors on your fall spectrum!